Customer Account Specialist manages the customer’s account and monitors related strategies. 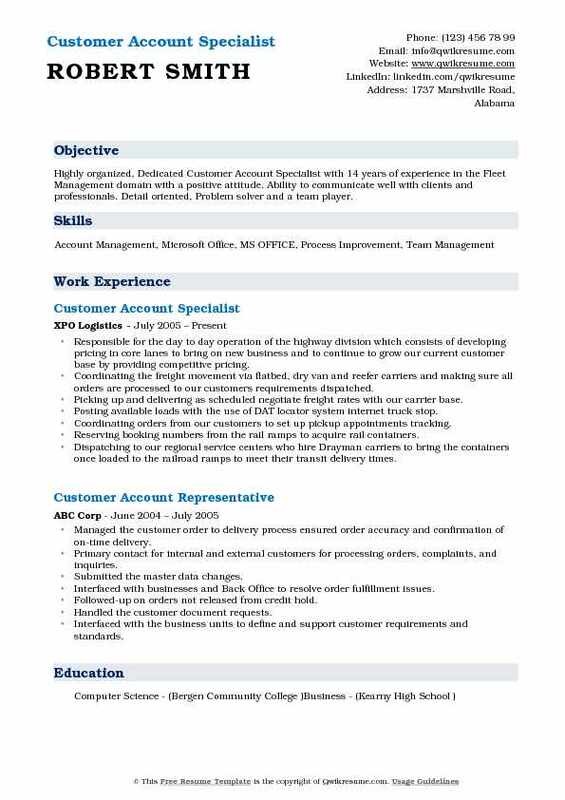 The job roles and responsibilities that are commonly seen on the Customer Account Specialist Resume include – updating the customer account database, liaising with customers, handling customer requests, offering support to internal and external customers, completing conversion mailing and assuring service quality. These specialists also take charge of preparing reports on account status and assist the customers or escalate the issues. Customer Account Specialists are expected to demonstrate a high level of communicative skills and be proficient in CRM Software and MS Office. 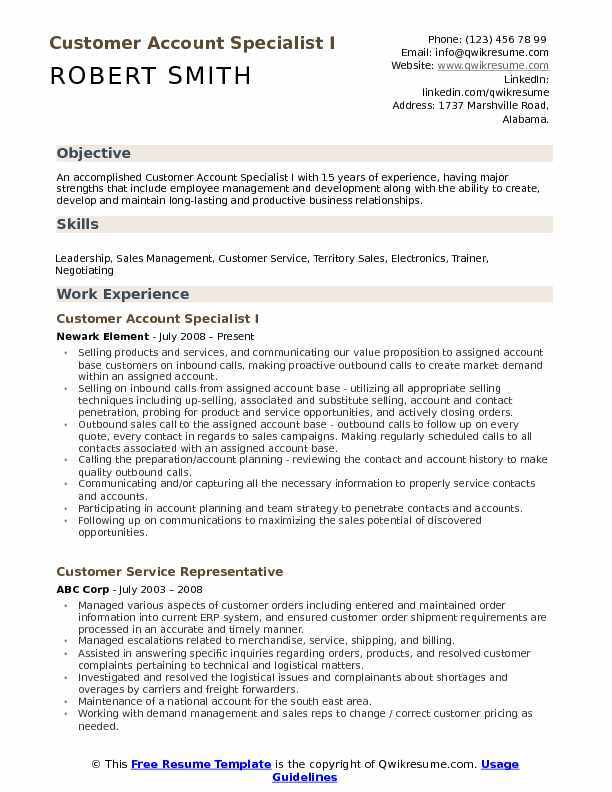 A resume that showcases proven experience in customer-focused solutions embodies an advantage. Individuals seeking a career in this line need to hold a Bachelor’s degree in Finance, Sales, Marketing, Business Administration, Accounting or Mathematics. 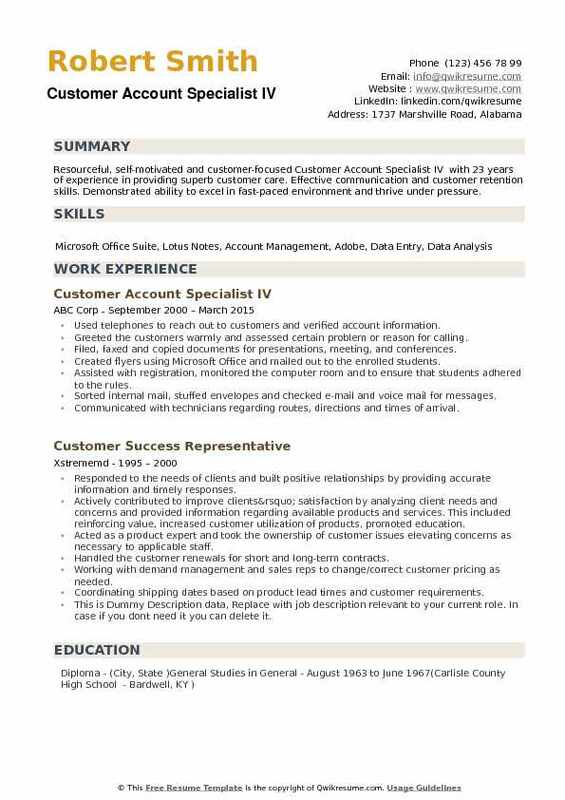 Summary : An accomplished Customer Account Specialist I with 15 years of experience, having major strengths that include employee management and development along with the ability to create, develop and maintain long-lasting and productive business relationships. Selling products and services, and communicating our value proposition to assigned account base customers on inbound calls, making proactive outbound calls to create market demand within an assigned account. Selling on inbound calls from assigned account base - utilizing all appropriate selling techniques including up-selling, associated and substitute selling, account and contact penetration, probing for product and service opportunities, and actively closing orders. Outbound sales call to the assigned account base - outbound calls to follow up on every quote, every contact in regards to sales campaigns. Making regularly scheduled calls to all contacts associated with an assigned account base. Calling the preparation/account planning - reviewing the contact and account history to make quality outbound calls. Communicating and/or capturing all the necessary information to properly service contacts and accounts. Participating in account planning and team strategy to penetrate contacts and accounts. Following up on communications to maximizing the sales potential of discovered opportunities. Managing an assigned sales base of over 200 accounts ($2million) and assisting them. Working with a team of individuals having the authority to assist the customer escalations, management level pricing approval and collaborate on quotes/orders and customer issues. 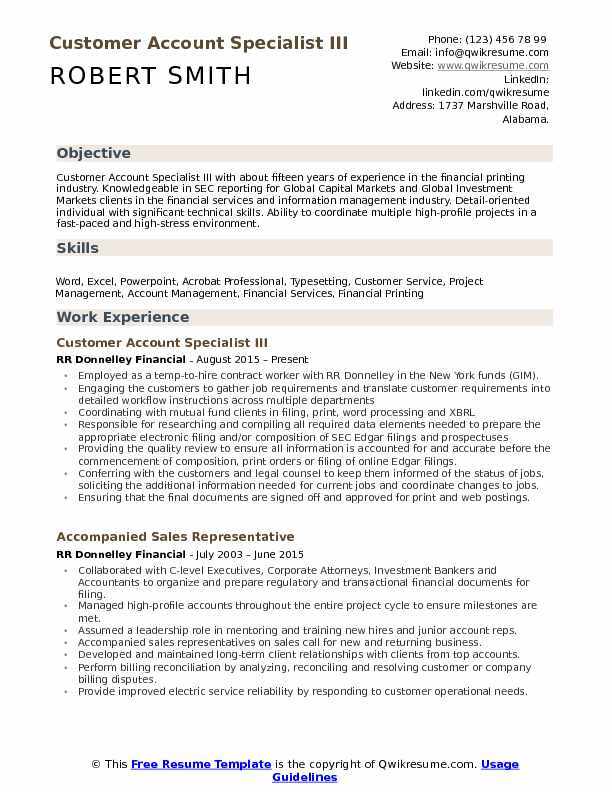 Objective : Junior Customer Account Specialist with 3 plus years of experience is seeking to find an opportunity that will allow me to demonstrate my skills and abilities in which I can increase my knowledge, therefore, becoming an asset to the business at hand. Ability to effectively communicate in writing in order to document study findings, prepare briefing materials, and develop correspondence relating to assignments. 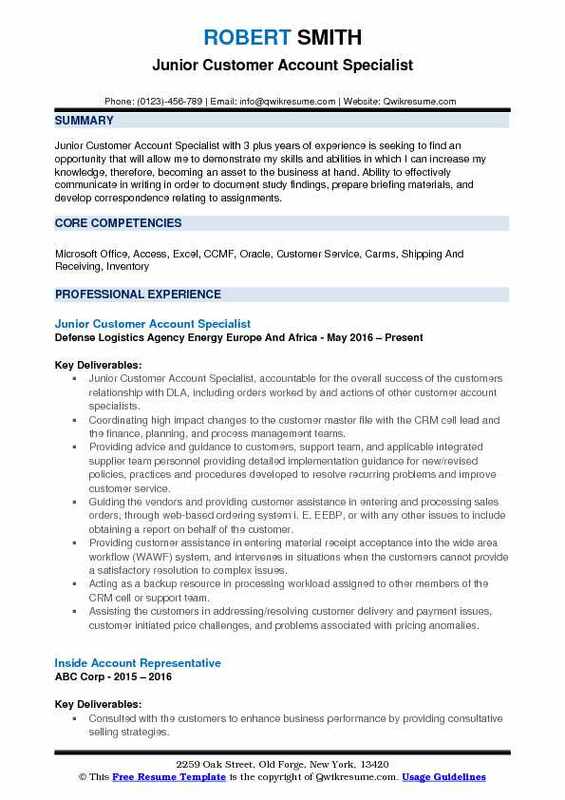 Junior Customer Account Specialist, accountable for the overall success of the customers' relationship with DLA, including orders worked by and actions of other customer account specialists. Coordinating high impact changes to the customer master file with the CRM cell lead and the finance, planning, and process management teams. 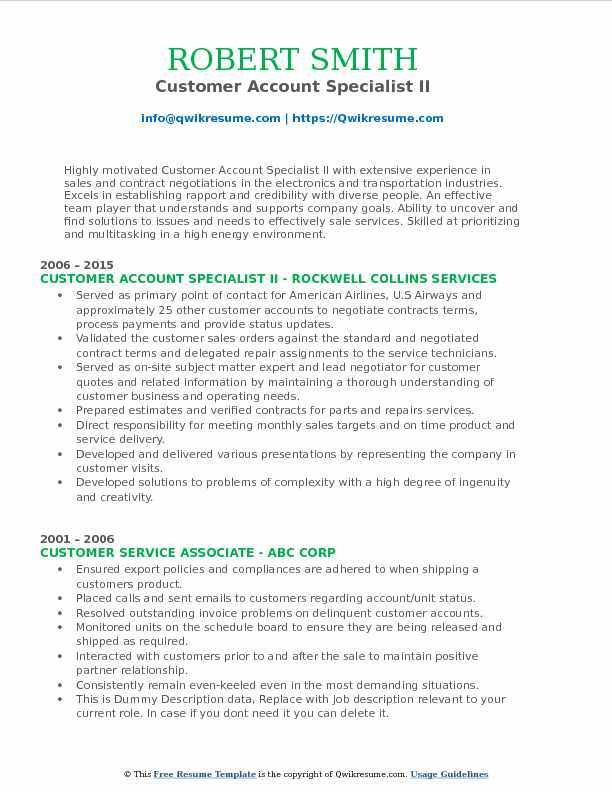 Providing advice and guidance to customers, support team, and applicable integrated supplier team personnel providing detailed implementation guidance for new/revised policies, practices and procedures developed to resolve recurring problems and improve customer service. Guiding the vendors and providing customer assistance in entering and processing sales orders, through web-based ordering system i. E. EEBP, or with any other issues to include obtaining a report on behalf of the customer. Providing customer assistance in entering material receipt acceptance into the wide area workflow (WAWF) system, and intervenes in situations when the customers cannot provide a satisfactory resolution to complex issues. Acting as a backup resource in processing workload assigned to other members of the CRM cell or support team. Assisting the customers in addressing/resolving customer delivery and payment issues, customer initiated price challenges, and problems associated with pricing anomalies. Knowledgeable of EBS applications related to order fulfillment i.e. Web-based system EEBP, WAWF, etc. , and skilled with the ability to apply and adapt analytical and evaluative methods in performing customer support studies. 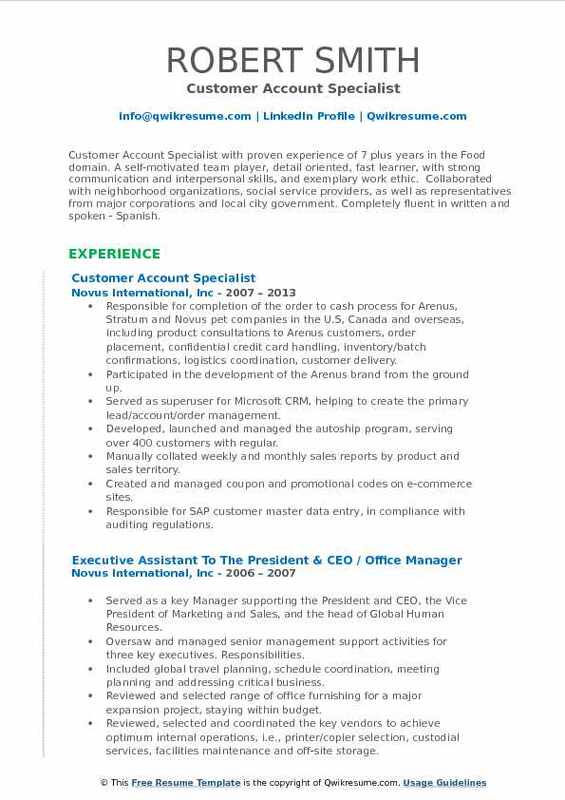 Summary : Highly self-motivated and goal-oriented Customer Account Specialist committed to pursuing a long-term career in Customer Service. Offer a 14-year track record demonstrating strong analytical and problem-solving skills, computer proficiency, and ability to follow through with projects from inception to completion. Interfacing with Account Managers and Customers to proactively manage all aspects of accounts, providing resolution to orders, invoice disputes, term agreements and a positive customer experience at all times. Partnering with the Accounting, Sales, Finance, Operations and Credit teams to improve working capital and minimize bad debt exposure by taking ownership of customer inquiries. Integrating, compiling, analyzing, and evaluating the data on sales performance metrics, including trends for products. Using the methods such as analyzing key metrics and coordinating with sales, accounting, supply and demand, and marketing teams to develop and implement customer experience solutions. Coordinating with the local, regional, national, and global sales teams to ensure sales goals are met and in compliance with the best practices. Reviewing the e2e profitability while coordinating with channel partners & suppliers on product availability. Implementing a simplified pricing process resulting in 100% reduction of invoice pricing disputes within a 6 month period on time. Interfaced with the Account Manager, Tax, Credit, Finance, and contracts team to successfully secure a $14 million contract. Fulfilling 100% customer orders during new product launches and removal by interacting with schedulers, PLM and marketing. Ranked in top 10% business intelligence user and first in offer to cash business unit to receive brown belt certification. Headline : Customer Account Specialist with proven experience of 7 plus years in the Food domain. A self-motivated team player, detail oriented, fast learner, with strong communication and interpersonal skills, and exemplary work ethic. Collaborated with neighborhood organizations, social service providers, as well as representatives from major corporations and local city government. Completely fluent in written and spoken - Spanish. Responsible for completion of the order to cash process for Arenus, Stratum and Novus pet companies in the U.S, Canada and overseas, including product consultations to Arenus customers, order placement, confidential credit card handling, inventory/batch confirmations, logistics coordination, customer delivery. Participated in the development of the Arenus brand from the ground up. Served as superuser for Microsoft CRM, helping to create the primary lead/account/order management. Developed, launched and managed the autoship program, serving over 400 customers with regular. Manually collated weekly and monthly sales reports by product and sales territory. Created and managed coupon and promotional codes on e-commerce sites. Responsible for SAP customer master data entry, in compliance with auditing regulations. Responsible for on-time and accurate reporting of quarterly sales to the national animal supplement. Coordinated order fulfillment and ensured full compliance with account requirements for the specialty accounts, such as Amazon and True Value, including receipt and confirmation of electronic orders. Summary : I am a detail oriented, and clearly dedicated Customer Account Specialist who aspires to succeed in any given environment. I have extensive experience of 7 years in Finance and various customer services industries, however, I am always eager to learn, and take on new challenges. I am a team player, whilst also being able to work well on my own. I am seeking a position where I can develop; yielding positive results for the overall wellbeing of the company. Input and reviewed the submitted personal loan inquiries from transferred online and "walk-in" applicants. Completed verifications and assisted with the approval and/or declination process of applications after pulling. Closed approved loans with new/present customers, per documentation provided for approved applicants. Operated primary cash drawer to process customer payments whether via mail, phone and in person. Logged and filed all vehicle titles used as collateral. Processed all customer paid in full accounts. Processed all attorney, CCCs, bankruptcy, and insurance payments. Responsible for daily collection calls to all. Made daily solicitation calls to former and present customers. Processed the applications from merchants/vendors. Responsible for processing payments to all utilities, supply, maintenance, repo and other miscellaneous companies and vendors. Monitored the office supplies and submitted the reorder of supplies to the Branch Manager as needed. Answered majority of incoming calls and assisted or directed the calls to appropriate person(s). Logged and filed all month end information. Summary : Highly organized, Dedicated Customer Account Specialist with 14 years of experience in the Fleet Management domain with a positive attitude. Ability to communicate well with clients and professionals. Detail oriented, Problem solver and a team player. Responsible for the day to day operation of the highway division which consists of developing pricing in core lanes to bring on new business and to continue to grow our current customer base by providing competitive pricing. Coordinating the freight movement via flatbed, dry van and reefer carriers and making sure all orders are processed to our customers' requirements dispatched. Picking up and delivering as scheduled negotiate freight rates with our carrier base. Posting available loads with the use of DAT locator system internet truck stop. Coordinating orders from our customers to set up pickup appointments tracking. Reserving booking numbers from the rail ramps to acquire rail containers. Dispatching to our regional service centers who hire Drayman carriers to bring the containers once loaded to the railroad ramps to meet their transit delivery times. Summary : Highly motivated Customer Account Specialist II with extensive experience in sales and contract negotiations in the electronics and transportation industries. Excels in establishing rapport and credibility with diverse people. An effective team player that understands and supports company goals. Ability to uncover and find solutions to issues and needs to effectively sale services. Skilled at prioritizing and multitasking in a high energy environment. Served as primary point of contact for American Airlines, U.S Airways and approximately 25 other customer accounts to negotiate contracts terms, process payments and provide status updates. Validated the customer sales orders against the standard and negotiated contract terms and delegated repair assignments to the service technicians. Served as on-site subject matter expert and lead negotiator for customer quotes and related information by maintaining a thorough understanding of customer business and operating needs. Prepared estimates and verified contracts for parts and repairs services. Direct responsibility for meeting monthly sales targets and on time product and service delivery. Developed and delivered various presentations by representing the company in customer visits. Developed solutions to problems of complexity with a high degree of ingenuity and creativity. Worked with the Sales, Marketing and Program Management to maximize the company's portfolio. Coordinated with the Finance and pricing department to process customer invoices, return orders and credit memos. Proactively gathered the customer information to provide analysis and data for monthly sales forecast. 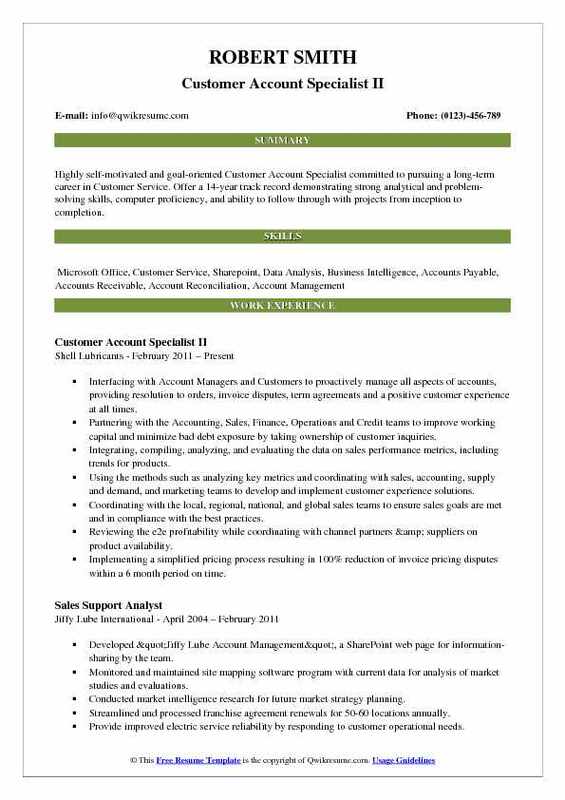 Summary : Customer Account Specialist with 11 years of experience is seeking a challenging career with a progressive organization which will utilize my skills, abilities, and education. Preparing the complete, accurate work and updating the customer file when needed. Listening attentively to customer needs and concerns and demonstrating empathy. Communicating effectively with the individuals/teams to ensure high quality and timely expedition of customer needs. Contributing the ideas on ways to resolve problems to better serve the customer and/or improve productivity. Participating in the activities/surveys designed to improve customer satisfaction and business performance. (CAS). Entering, maintaining and releasing the customer orders-to include entry and allocation of product. Providing the documents as required for both domestic and international customers. Being a focal point for all customer communications, except for technical issues and new business. Assisting in resolving issues relating to inventory discrepancies, shipping problems, and invoicing issues. Issuing the credits when needed. Preparing daily, weekly and monthly reports as required for customers and internal use. 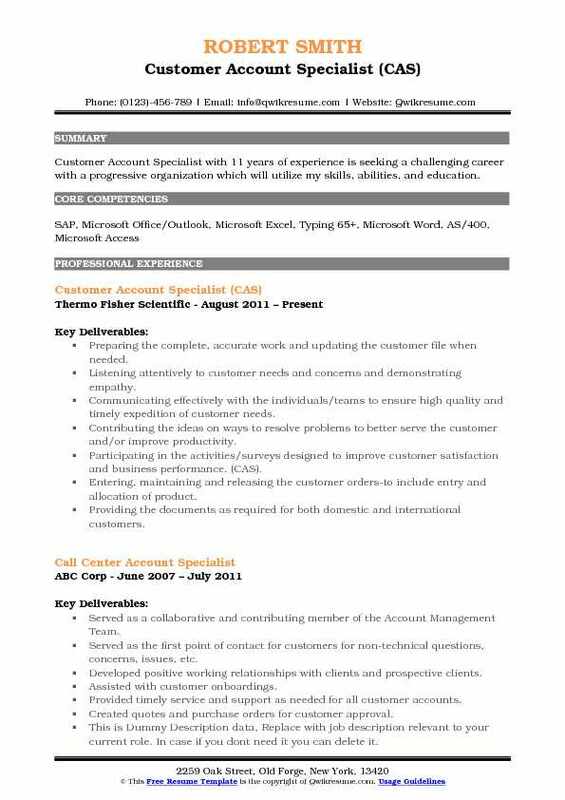 Summary : Resourceful, self-motivated and customer-focused Customer Account Specialist IV with 23 years of experience in providing superb customer care. Effective communication and customer retention skills. Demonstrated ability to excel in fast-paced environment and thrive under pressure. Used telephones to reach out to customers and verified account information. Greeted the customers warmly and assessed certain problem or reason for calling. Filed, faxed and copied documents for presentations, meeting, and conferences. Created flyers using Microsoft Office and mailed out to the enrolled students. Assisted with registration, monitored the computer room and to ensure that students adhered to the rules. Sorted internal mail, stuffed envelopes and checked e-mail and voice mail for messages. Communicated with technicians regarding routes, directions and times of arrival. Resolved issues regarding installation, work orders, and customer service needs. Answered phone inquiries, scheduled appointments for the President, set up meetings with potential customers. Processed incoming and outgoing mail, ordered office supplies and computer parts. 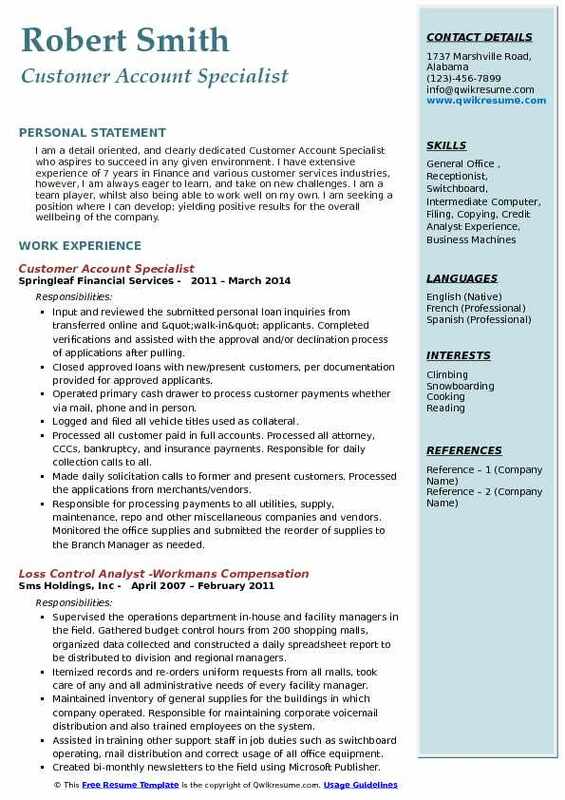 Summary : Customer Account Specialist III with about fifteen years of experience in the financial printing industry. Knowledgeable in SEC reporting for Global Capital Markets and Global Investment Markets clients in the financial services and information management industry. Detail-oriented individual with significant technical skills. Ability to coordinate multiple high-profile projects in a fast-paced and high-stress environment. Employed as a temp-to-hire contract worker with RR Donnelley in the New York funds (GIM). Providing the quality review to ensure all information is accounted for and accurate before the commencement of composition, print orders or filing of online Edgar filings. Conferring with the customers and legal counsel to keep them informed of the status of jobs, soliciting the additional information needed for current jobs and coordinate changes to jobs. Ensuring that the final documents are signed off and approved for print and web postings. Coordinating the production of printed documents and components with other internal plants and/or external vendors.